We all know the importance of first impressions; that applies to your living space as well. But creating an attractive, functional apartment is easier said than done. That’s why we’re giving you a leg up by sharing shopping sources for all of the necessary components of this warm, inviting living room. Read on to check out our recipe for a modern living space without the headache of endless hours of shopping. The key is to start with the perfect sofa, one that will provide you with both form and function. This navy blue sectional from Rivet will do the trick, with its versatile color and handy reversible chaise—which means you have the option to swap it to the other side depending on the layout of your room. A unique coffee table is a great opportunity to add some character to your space, and this half sphere design will certainly contribute a healthy dose of personality. 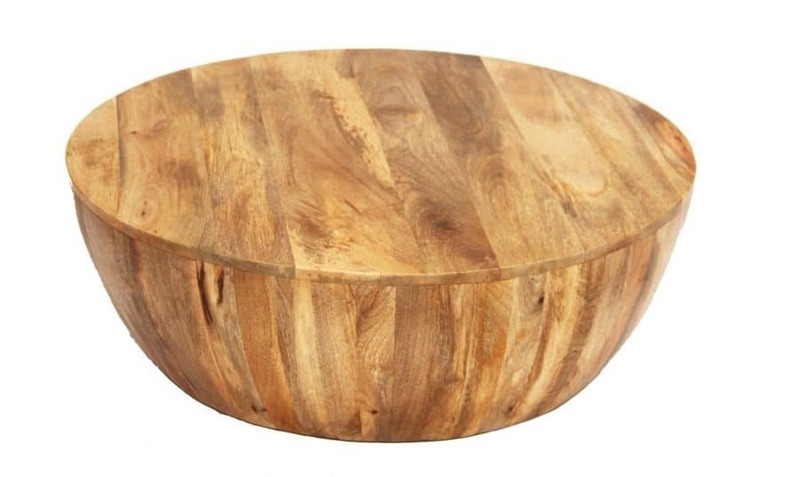 Made of mango wood, this piece is durable and sturdy, and the solid shape will ground your living room in a way that other tables won’t. Ottomans are one of the most versatile pieces of furniture that you can buy—beyond functioning as a place to put your feet, they can also be used as extra seating and can be stashed in a number of different areas of your apartment. 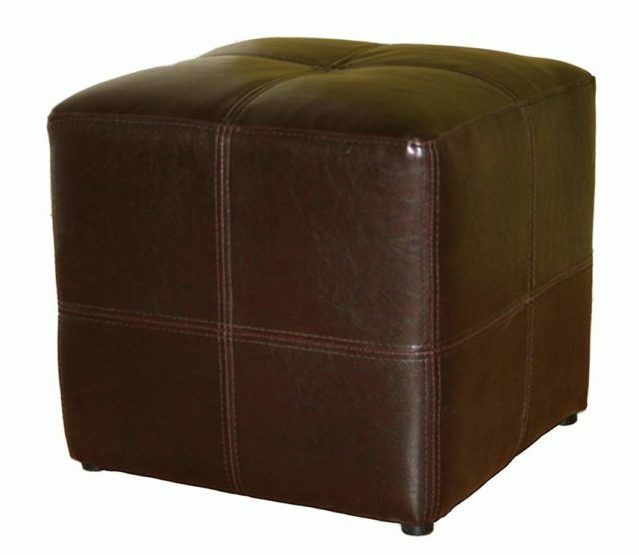 And at that price, you could get a pair of these brown leather cubes for every room. 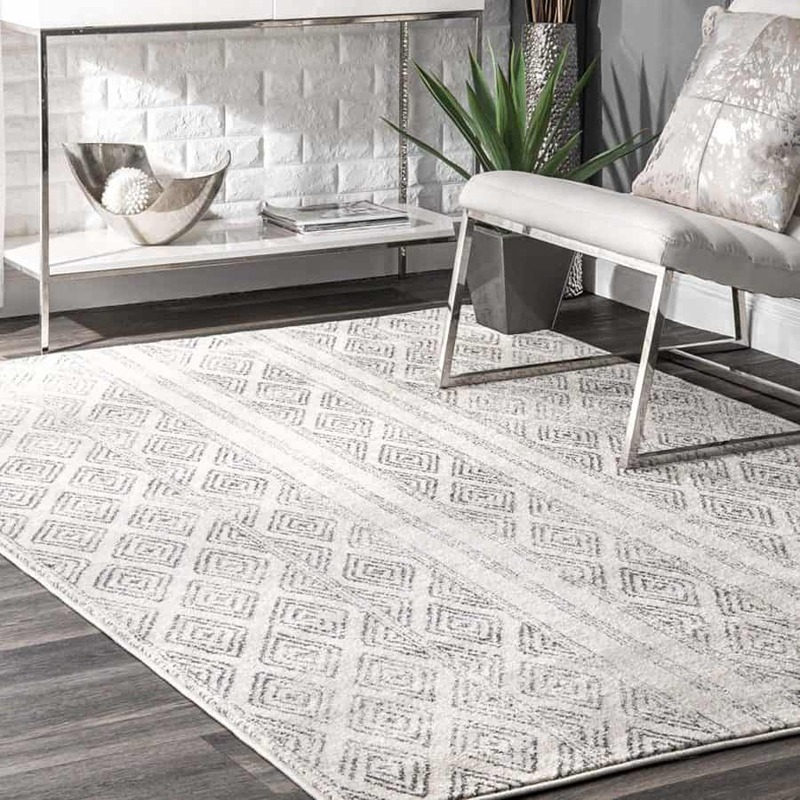 A rug is an essential element of any room, and the diamond pattern will add a bit of visual interest to an otherwise fairly neutral space. 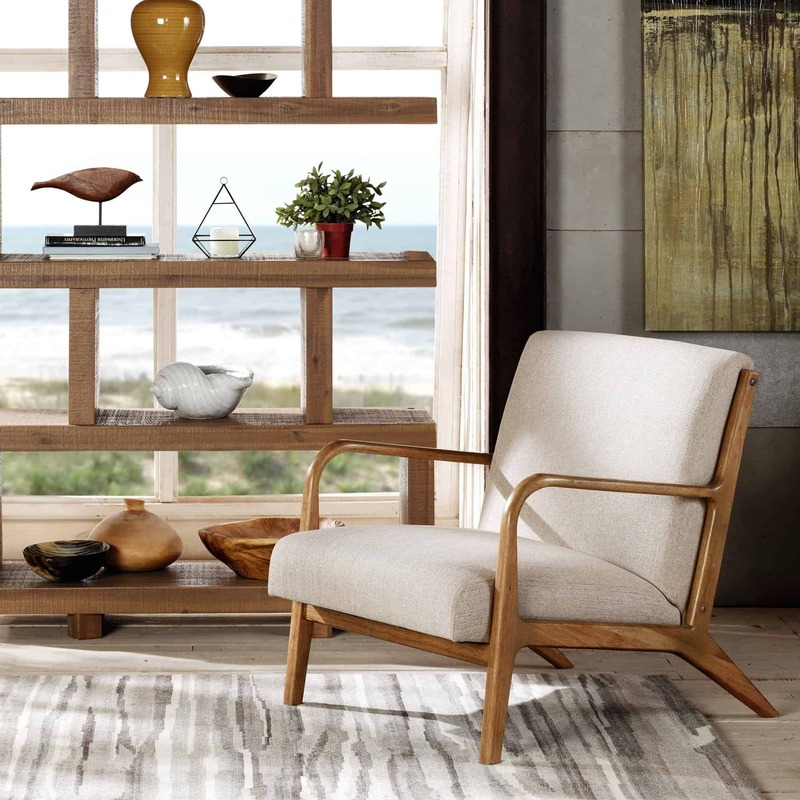 The gray and white tones will pair nicely with the wood and leather finishes, and the small price tag will allow you to spend a bit more money on furniture and accessories. The living room in the inspiration image has a common thread throughout: the appearance of rectangles. 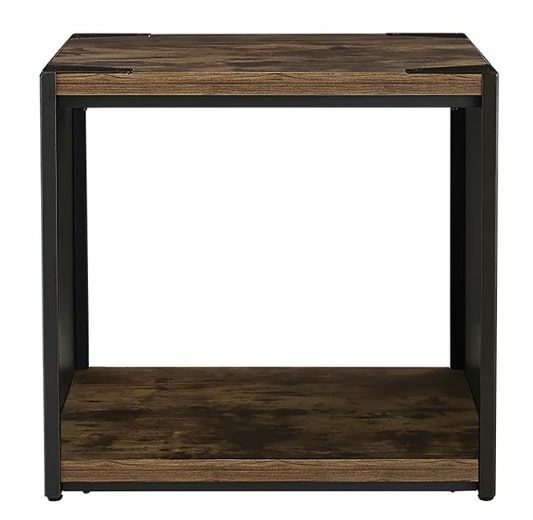 This square end table fits the theme perfectly, with its cube-like shape and open center. The no-frills style coordinates well with the other pieces, and the lower shelf provides an additional surface for storage. Wall art is a great place to experiment with adding a bit of your own personality to your living space. 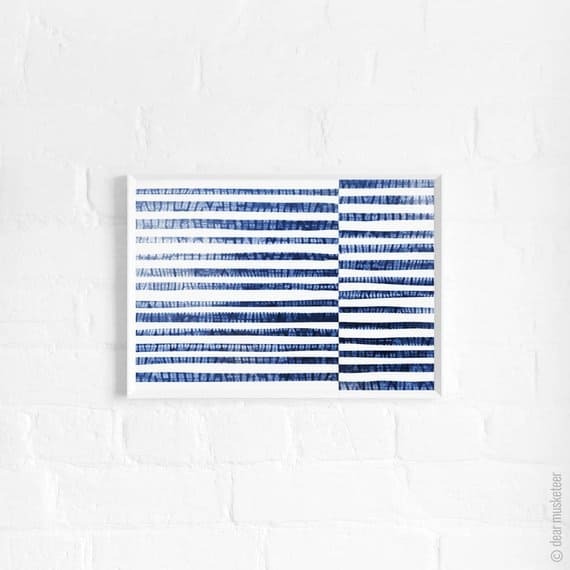 This blue and white print is reminiscent of the shibori dying process, yet in a graphic, non-textile way. Pair two side-by-side to get the look of the bold wall art in the inspiration photo. Texture is an important part of any living space, and we’re not just talking about soft, fluffy blankets. Hard, metallic finishes like that of this hourglass-shaped accent table can be an interesting juxtaposition to the softer fabrics of the the sofa and rug. 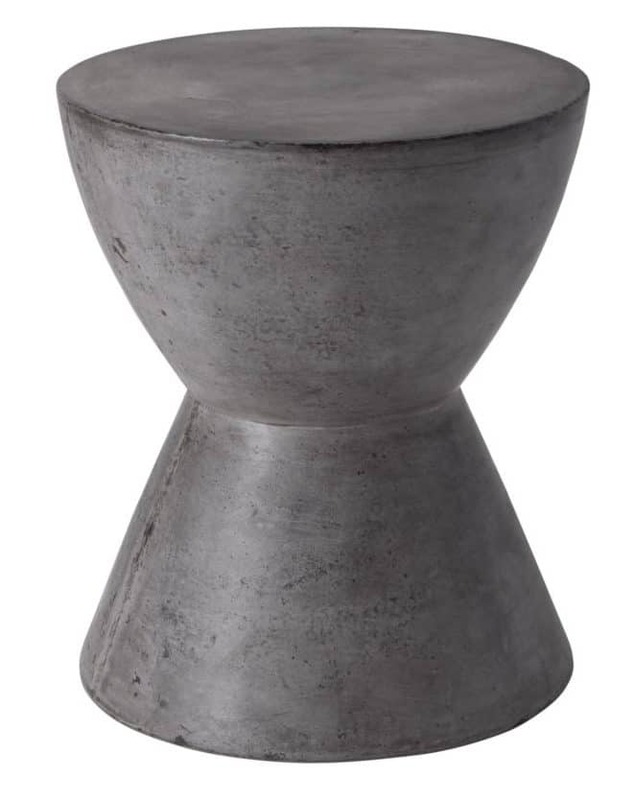 This distressed gray table will provide the perfect spot for a beer or a magazine. Clustering a pair of lounge chairs across from the sofa is a good way to give your space a more balanced feel, while also creating extra seating for guests. The wood frame pairs well with the coffee table, and the cream colored upholstery adds a bit of lightness to the space. Because most of the fabrics in the room are quite neutral, it’s important to introduce a pop of pattern in some form. Throw pillows are perfect because the investment is low compared with the ultimate effect. 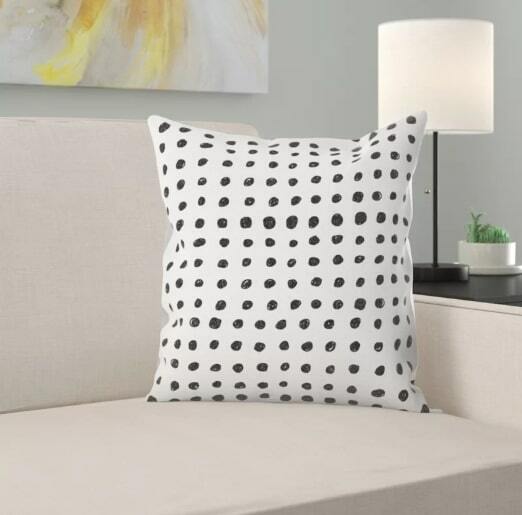 This black and white dot pattern works nicely with the rest of the space, without being overwhelming. 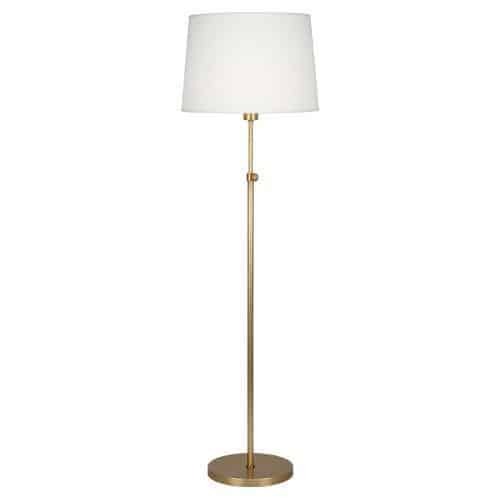 A great floor lamp is a must, even if you already have an overhead light. This one will add both form and function to your space, and its classic shape will coordinate easily with the other decorative accents. It’s adjustable, so you can change the height depending on the scale of your other furniture. 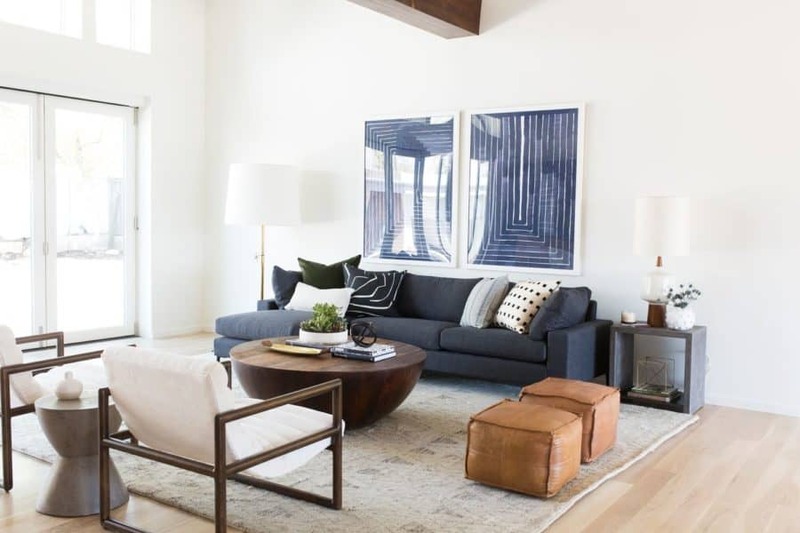 A decorative accent or two will go a long way toward adding character to your living room, lending a personal touch that will ensure that the room doesn’t look like a catalog. 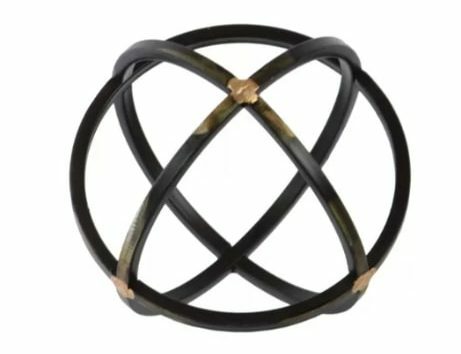 This orb-shaped object mirrors the round silhouette of the coffee table, and the black color will pick up the dark tones in the rug. The key to assembling everything is to make sure that it works within your space. If you have a lot of square footage, consider buying a larger rug and spreading the furniture out a bit. If you’re not working with much space, cluster everything closer together. As you can see, many elements are needed to create an attractive, functional living room…we hope this shopping list has taken most of the guesswork out of it for you! Got a room that you’d like us to recreate? Post a pic in the comments and maybe we’ll feature it!